The design of Ashes of Creation adheres to five main pillars. In designing Ashes of Creation, we adhere every detail to five main pillars: Engaging and Immersive Story, a Reactive World, Player Interaction, Player Agency, and Risk vs Reward. Even in the environment, everything you as the player do will tie into these pillars, while everything your guild does, everything your server does will ultimately keep the world fresh, ever-changing, and most importantly... exciting. There were originally four design pillars: Economy, Nodes, Meaningful conflict and Narrative. 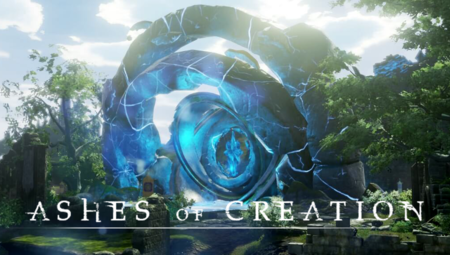 Ashes of Creation (AoC) is an upcoming MMORPG, set in a high fantasy open world. Ashes of Creation is an upcoming MMORPG set in a world of high fantasy where player’s choices will shape and define the world around them. Ashes of Creation is a unique take on the MMO experience. Our world structure is dynamic and built to react to the actions of our players. Cities will rise and fall, their populations based on the history of the world as the players create it. Quests will unlock as these populations gather, their needs grow, and secrets are unlocked. As the world’s NPC structure is established in real time, players will have the ability to destroy what they’ve created, paving the way for new development, new populations, and real change. Political strife and intrigue will play a very real role in the structure of your world. Gone are the days of static worlds, change is here to stay. When it comes to how MMO’s have been traditionally designed, most gamers are familiar with two distinct types of gameplay loops: the “theme park”, and the “sandbox”. The vast majority of MMO’s we’ve all seen come and go in the gaming industry have been of the theme park variety – these games put the player onto a specific path, guiding them along, with plenty of pretty sights in between the same old quest hubs, very little in divergent paths, virtually no freedom in player progression. Recently the MMO genre has seen some games of the sandbox nature come onto the scene, but despite the ultimate freedom the sandbox affords players, many are left wanting more, as there is by definition no pre built world content, no human touch, just the vastness of the “sand” for lack of a better term. Thus many MMO players often find themselves caught between the repetitive rock of the theme park or the vast dead spaces of the sandbox’s hard place. This chasm between the state of MMO gameplay loops is where we intend to inject Ashes of Creation’s Node system. Ashes of Creation has taken inspiration from various other MMORPG titles. Eve Online with its regionalized economy and risk vs reward in transportation. ArcheAge with its building systems, transportation and naval combat. Lineage II with its castle sieges, flagging, open world PvP and guild progression. Star Wars Galaxies with its crafting systems. There is not going to be a typical end-game in Ashes of Creation. ↑ Livestream, 3 May 2017 (11:33). ↑ 3.0 3.1 3.2 A reactive world - Nodes. ↑ 4.0 4.1 4.2 About Ashes of Creation. ↑ 6.0 6.1 Interview, 24 August 2018 (8:35). ↑ 7.0 7.1 Video, 5 April 2018 (40:08). ↑ February 8, 2019 - Questions and Answers. This page's content was last modified on 23 February 2019, at 00:11.